Below is a list of Cycle Power Assist options available in Australia as I've experienced them. They are in no particular order of preference - just take them as they come and some may now be out of date. Sorry about that!! This would have to be the cheapest hub motors I've seen. Dale Monger is importing these and a lot of positive comment is said on the power assist internet mailing list about them. Dale said recently - All the motor kits will be the same price, i.e - AUS $550. For more information you can view the Crystalyte site at www.crystalyte.com. If you have any specific questions feel free to E-mail me. dale_monger@yahoo.com.au I have ordered three front hub motors and two rear hub motors (with base for cassette cluster + integrated disk), but the order has yet to be shipped. All kits are for a 26 inch wheel. If you had a specific requirement, I may be able to get the order changed. I also have a number of prismatic NIMH batteries and Lithium Polymer batteries that I am currently testing and intend to sell. Oatley Electronics has several motors and speed controllers. SPEED CONTROLLERS: Speed controller modules for the 24V dc motors we stock. They come with a connection diagram. Only 7 wires are used for the speed controller function: Battery connections, Motor connections, and 3 wires for the motor speed controller potentiometer. These units require a 4K7 or 5K pot & a 2k7 resistor (not supplied) to replace the original throttle. Other optional connections are for disabling the controller (switch on brake), power for auxiliary circuits etc. We do not supply any additional connectors, just the modules as pictured. Connectors can be cut-off from the bigger module, the smaller module easily comes apart (4 screws) and the terminals can be easily be soldered to. Currie Technologies are the manufacturers of the world famous US ProDrive propulsion system for bicycles. The US ProDrive allows the end-user to convert most standard 26" or 700c 36 spoke bicycles to electric power and has the maximum amount of power allowable for Australian roads without the need for license or registration. The kit includes all items necessary to convert most bikes including a battery pack, the motor/electronics unit and the speed controller, all of which takes less than half an hour to install. A US ProDrive equipped bicycle has a range of 20-30km and a cruising speed of 25km/hr. No registration, Bernardi alloy engine, 90km per/litre of fuel, manufacturers 12 months warranty, full suspension, V-Brakes, alloy frame, 18 speed gears, $2400 including GST. ED This is a roller on the tyre petrol powered motor that mounts on/near the bottom bracket of the bike. If I've got it right I've heard it called by another brand name Kangabike and can be jump started using the momentum of the bike rather than pull starting. Cost - $1150 plus GST and frieght. In Feb 2001 here in Tasmania, Australia a Worldwide Penny Farthing Championships. 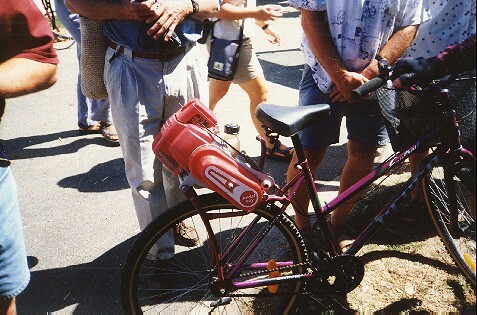 As part of the event they had some novelty races, one of which was a power assist cycle race. Here are 2 pics of a Honda 4 stroke, friction roller on the tyre commercial setup. All looked very neat - run real quiet even at full speed and had a lever to lift it off the tyre when coasting. 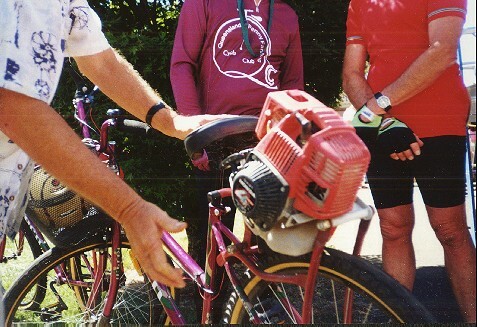 21/7/2001 - Go to an web page with pics, video's etc of a Pedal Ezy installed on a recumbent trike. Greenspeed sell the Heinzmann hub motor kit and for friction 'roller on the tyre' kits both a Honda 4 stroke and ZAP kit. Sure, it's a very good hub motor, just swap it for your rear wheel, no mucking about with extra drive and it's more efficient than roller drives. It's approx 200 to 400 watts on 24 volts - twist grip control - complete free wheeling. Takes a screw on cluster. Only drawback is price $1,500 with controller. Have a range of speeds, no load at 30 or 25kph. Can run on 36 volts for more speed and power. Qn: Also do you have any other electric and/or IC systems? 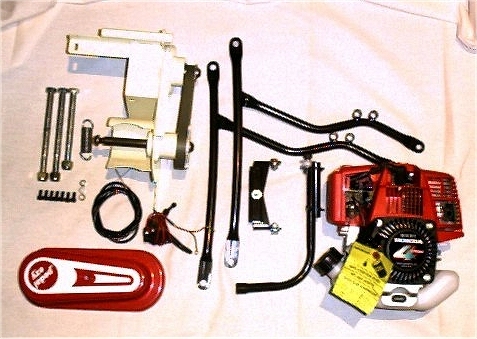 Sure got the Zap system (roller), and also the Honda 22cc four stroke (roller) Usually sell the Honda set up for $1,500, but have one s/h for $1,000. $1,000 for Zap with battery - Heinzmann without. Can I have just a little more info on the hub? Just so I understand it - In total for $1500 you get the hub motor, speed controller circuitry and a twist throttle grip. Is this right? Can it be spoked for a normal 20" rim? Yes, its got a 164mm pcd. We use the Araya 7X rim because it has the dimples. Usually sell the Honda set up for $1,500, but have one s/h for $1,000. A pivot mounting so the roller can be swung into the tyre. Is there a different roller choice for speed? You could machine more rollers from Al. bar. I think there is a 25mm with motor. Approx. 40 kph - depends on roller size. Does the mount allow it to be lifted off the drive wheel to freewheel? We have been running it off and on for about a month, simple friction lever operation against spring loading, good on fuel, no accurate checks yet, top speed about 40 kph, not much in the way of tyre wear, and most importantly, it helps the wife.. This last was the main reason for the exercise, I wasn't really into the idea of producing them for resale, unless someone bought one of our trikes and wanted a motor fitted, then I might think about it. Greenspeed do or did offer the same motor as an add-on, and I dont hear much about motor assisted Greenspeeds, so I dont think there would be much of a market, and besides the motor used in such a way would bomb out the warranty. A good try and its fun, but maybe not again. Alan Strange runs Astec Equipment Services, a company that repairs, reconditions and customises wheelchairs and other disability Equipment. He also recycles electric motors and batteries suitable for Power Assisted Bikes and is a keen HPV builder and electric bike enthusiast. Astec also sell the US Pro Drive electric assist. Preslite Drive Technologies Pty. Ltd. Phone : (+ 61 3) 9460 6566. Could you please send me some more details? Try http://www.ozebike.com/hub_motor.htm for more details on the motor. It suits any wheel with 36 spokes. It includes the twist grip speed controller. Yes it takes a standard cassette. I can post it to you for $22 freight. Cost of Hub motor and speed controller $680. 3 left in stock until next shipment in Feb. Sorry but we don't stock e-bikes or hub motors any longer, there wasn't enough interest. World Wide Electric Vehicles is indeed the Australian Agents for Toprun electric vehicle equipment. At the moment bicycle hub motors, electric bikes and electric vehicle batteries are the centre of our attention. We sell the motors or complete kits to convert your own bike to electric as well as a range of bikes including a mountain bike, a downhill bike and a high quality stepthrough city bike. I would be delighted to provide photos and whatever details you would like about Toprun products. Cycles mainly for the disabled rider. Custom built options incl electric and petrol power assist. .............I ended up ordering a direct drive 400 watt motor from the Northern Territory University. Energy Section. You can make motor enquiries to Liz Marshall or Byron.Kennedy, Ph (08) 8946 6386. They have apparently formed a company for the manufacture of direct drive hub and pancake motors. I have been told to expect an AUD1500 price tag for motor, controller in a wheel. Woohoo! The NTU has finally come up with my hub motor! Someone on this board asked me to post when they were ready. email Byron.Kennedy@ntu.edu.au if you want one. "In general, they peak at an efficiency of around 90%. 12V gives 400rpm, 24V gives 800rpm. 12V version has a 40A current limit, however it is power limited to 200W. The 24V version has a 30A current limit - maximum power I would estimate at ~600W for the 24V version due to the fact that you cannot get full current at full speed. Output torque of the 24V version will be approximately 10N-m. The 20" rims look excellent - I like the small wheels - also the small wheels will feel better to ride. 36v Sealed lead Acid battery, Hub Motor. 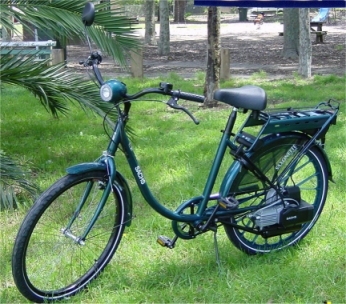 Product types: electric bicycles, electric cars, electric scooters, hybrid electric vehicles. I have just been searching in the Trading Post on the Net in all the Australian States looking what is sold at the moment in assisted bicycles. One thing that surprised me was how many are available in the State of Queensland. Anyway... The Ad below was also a revelation - I can't imagine with this sort of quoted speed that these are legal. I haven't been out to see it yet, but here are the specs: 25cc John Deere 2-stroke engine Friction drive Mounting bracket It comes with a throttle for the handlebars and a clutch lever for the handlebars that allows you to stop at light with the motor running. From what I can gather, the 25cc motor is from a trimmer and hp for 25cc seems to be about 1.3hp which is almost 5 times the legal power in Australia for motor-assisted pedal cycles. This is an excellent survey of electric bikes and power systems available world-wide.